I am pleased, although most certainly not the first, to say that every bit of evidence - from photos to videos to audio clips to eye witness reports - of anything considered paranormal in the popular lexicon, no matter how old it is, no matter who obtained it, no matter where it came from, is completely and 100% explained and is absolutely NOT paranormal in any way, shape, or form! It's all 100% natural and/or a man-made hoax! Yup, just ask the internet and/or many card-carrying members of a sceptical organisations. Lately, I've noticed more and more "successful" debunkings of anomalies up to and including the "HOW TO" step-by-step on repeating the photo yourself! 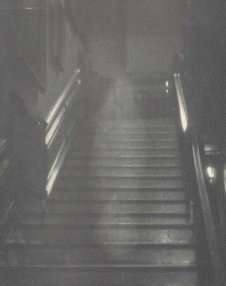 Above is the famed photo of The Brown Lady of Raynham Hall. I've found several sites and groups explaining how this rather famous photo was hoaxed by simply adding a dual layer via Photoshop and changing the opacity of that layer. Simple and easy-peasy! This one too, from Combermere Abbey library... another simplistic Photoshop job. 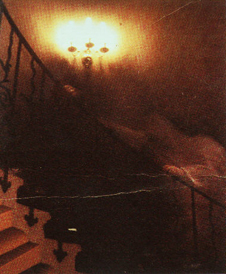 I guess they were using Photoshop v.1.0 or earlier as the images were taken in 1936 for The Brown Lady, 1892 for the Combermere chair image, and finally 1966 for the staircase. For those of you under the age of twenty-five, the personal computer market prior to 1940 was not quite the same as it is now. Now, instead of those would-be sceptics and debunkers, (once they recovered from their frothing anger over this article of course,) write the usual argument that Photoshop is simply a computer variant tool of the old "knife-and-tape-and-airbrush" tricks of a bygone era, you're right... but then why prove a hoax with a computer model? Why not, oh, I don't know, prove it using the tools they had back in the day? Is it too much work? Also, are you 100% sure your efforts would match, picometer to picometer the original? 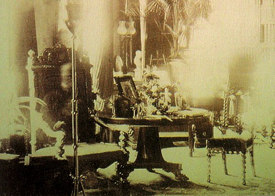 Besides, photographic expert - sorry, photographic analyst Joe Nickel (who has an emeritus degree in English, lists himself as a document expert, and has a vested and commercial interest in saying all things paranormal are bunk,) said the Brown Lady was a double-exposure anyway... granted, this was prior to Reddit, so it probably doesn't count. I have seen the same lazy, half-assed nonsense "debunkings" done to everything from videos to audio clips... with "experts" showing how they could fake things using a computer model... from eras when those tools weren't available... and yes, many of the now "absolutely fake" things have been properly examined in the past and the most common response from those who actually do know what they're doing and talking about is, "I don't know how that was done." or "There's no obvious signs of fakery."... well, that last one... they obviously didn't load Audacity to check and manipulate things, and were unfamiliar with the workings of many fine Adobe products. The problem is, using a computer model even under the best circumstances is rarely considered a fete accompli for anything. It's a first step, sure, but a genuine model needs to happen first and then a final model to gel the hypothesis or structure. Sorry, but that's science... not a twenty-something hipster who's afraid they'll be kicked out of the Sooper Smart Science Klub unless they crap on everything that smacks of being odd so they prove their righteousness using their gaming rig and the latest copy of Gimp. After all, with a good CG model, I can prove that Los Angeles and New York have been destroyed multiple times by various natural disasters and the odd daikaiju. This is not to say that all debunking efforts are bad... not at all... and we all should be legitimately sceptical (scepticism means "doubt", not "deny",) when presented with something said to be genuinely paranormal... but it's bad science and just bad thinking to both accept it without examination or to say it's nonsense without absolute proof of that conclusion either. #1: Is the person philosophically unbiased in their work? Did they leave their own beliefs or disbeliefs aside while examining the evidence? #2: Does the person stand to benefit from a conclusion? Is the person a professional "sceptic" (non-believer) or a professional believer that would financially or otherwise gain from debunking the evidence? #3: Have they presented a complete model as to their hypothesis? Have they shown their explanation was a possibility at the time of the evidence's production? #4: Are they presenting it as the absolute and final conclusion to the cause of the image, or are they presenting it clearly as one potential explanation? If they are saying this is the complete and final truth, have they absolutely concluded this with a full and genuine comparison of not only the original, but accounting for the time, place, and people involved with the evidence capture? Basically, unless there's obvious (and I mean *obvious*) flaws with presented evidence, it can only be supposition that it's fake... and if the notion it's nonsense is presented with good evidence to support the claim, but not absolute evidence of chicanery, then it can only be considered a possible hypothesis. ...I could have as easily shown images of UFOs that have been badly debunked, cryptozoological images found by some to be wanting, and a host of other things. I could have also included film and video footage, audio recordings, and even some people's first-hand reported accounts that the miracle armchair debunkers have managed to "resolve". The effective statement above stands in terms of looking at all of them... If a person is presenting a hypothesis or model to prove or disprove something, that model better be complete and correct for the period the evidence was gathered. After all, CLAIMS REQUIRE EVIDENCE.